The White House and U.S. House of Representatives' ultra-conservatives reportedly were negotiating Wednesday night to repeal the Affordable Care Act's insurance benefit rules in a last-minute effort to salvage House Republicans' ACA replacement bill. The provision being discussed would erase the ACA's minimum essential benefits requirement for fully insured plans in the individual and group markets. That requires all plans to cover benefits in 10 categories, with benefits determined by the states but comparable to the most common small-group plans. The amendment to the American Health Care Act would have to be approved by the House Rules Committee, along with other revisions drafted Monday. 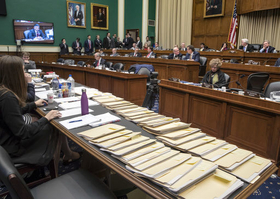 The committee adjourned Wednesday night without receiving the proposed benefit changes, though the chairman, Rep. Pete Sessions (R-Texas), indicated that he expected to receive the latest revisions on Thursday. GOP leaders hope the full House will approve the bill Thursday. It's unclear whether they have enough Republican votes to pass the bill, as several have spoken out against previous iterations of the proposal and no Democrats are expected to support it. But inclusion of the benefit changes could alienate more moderate Republicans in both the House and Senate, who may fear it would reduce coverage and care access for women and people with chronic health conditions including mental illness and substance abuse. In addition, the benefit change could jeopardize passage of the bill in the Senate under that chamber's expedited budget reconciliation process, which requires only 51 votes. Under Senate reconciliation rules, known as the Byrd rules, all bill provisions must be germane to budget issues. It's highly uncertain whether the Senate parliamentarian would determine the primary effect of repealing the benefit rules is budgetary. The Republicans' budget reconciliation bill repealing the ACA in 2016, which was vetoed by President Barack Obama, did not include the law's insurance regulations because the parliamentarian said that would not comply with the Byrd rule. It's also uncertain whether the nonpartisan Congressional Budget Office will be able to issue a new score on the bill's budgetary cost and coverage impact before the House votes, and how the repeal of the benefit rules would affect the score. Conservatives long have argued that eliminating benefit mandates would reduce insurance premiums and let consumers buy benefit packages that best meet their needs. Members of the ultra-conservative House Freedom Caucus, who are trying to negotiate the deal, say killing the ACA's insurance market regulations is key to making coverage more affordable. Some conservatives have argued, for instance, that men and women who are past their procreative years shouldn't have to pay for maternity care, allowing them to pay lower premiums. But healthcare providers, policy experts and consumer advocates say repealing the essential benefit requirement would sharply increase premium costs for people who need particular types of coverage. They argue that this would, among other things, reduce access to behavioral healthcare and addiction treatment services. Prior to the ACA, many health plans did not cover all these services, particularly maternity services, behavioral care, prescription drugs and preventive care. Commenting on the negotiations over the benefit rules, Rep. Mark Meadows (R-N.C.), chairman of the House Freedom Caucus, said his group was “encouraged just based on the real willingness of not only the White House but our leadership to make this bill better.” His group, which has enough votes to kill the House bill, hoped to have a deal by noon Thursday. The Freedom Caucus also wants to include a repeal of the ACA's requirement that insurers must accept all applicants regardless of pre-existing medical conditions. But the White House reportedly rejected that demand. A spokesman for Senate Democratic leader Charles Schumer of New York told the Hill newspaper that repealing the essential health benefits requirement “will almost certainly not be permissible” under Senate reconciliation rules. If Congress repeals the federal requirement for minimum essential benefits, it's likely that states would determine benefit requirements. But pressure from provider and patient groups at the state level over many years has led to more benefit requirements, not fewer. Elected officials have been reluctant to decide which benefits are or aren't medically necessary. Jim Manley, a Democratic lobbyist and ex-aide to former Senate Democratic leader Harry Reid, said repealing the minimum benefits requirement is one more feature that will doom the House GOP repeal-and-replace bill in the Senate. He said many Republican senators, such as Ohio's Rob Portman, will worry that it would hurt access to substance abuse treatment in their addiction-wracked states.